I redacted her email address because it isn’t important. The only reason I got involved in this case is because of the reporting by the Pantagraph. Michael Cadena was sick of Brady-Lunny and contacted me. 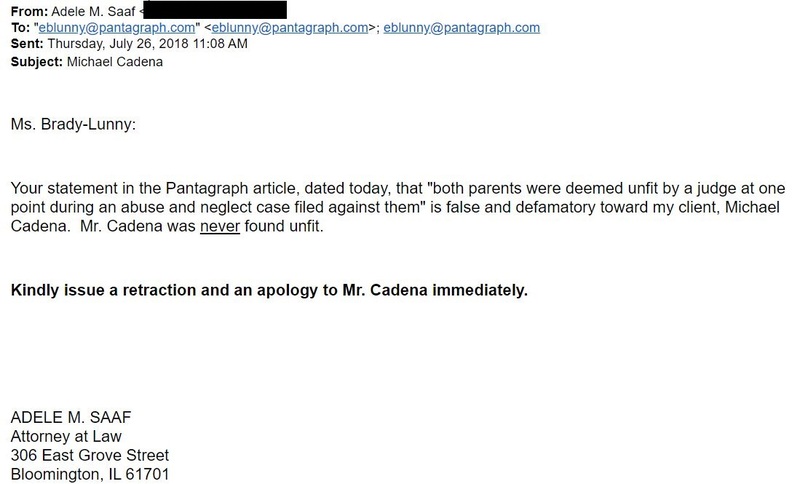 Has the Pantagraph printed a retraction and apology? Not that I’ve seen, but then I don’t subscribe to #FakeNews. I think I saw a Facebook post saying the cost for 52 weeks is going up again. The bill may say 52 weeks, keep in mind it never is. Posted in BloNo, Bloomington, Liberal Media, Local, Pantagraph.Tagged Adele Saaf, Edith Brady-Lunny, Michael Cardena, Pantagraph. As I pointed out a few weeks ago, related to another Paragraph outrage, Brady-Loony is scum! Did you remove your libelous story about Mayor Renner? Claiming someone is guilty before an indictment, let alone a conviction, is a textbook case of defamation. But journalistic ethics isn’t your strong suit, Diane. Read the paragraph then! They are always accurate. ha ha What story are you talking about? There is one called Renner is Guilty – if you ready the story he was!